We've been trying to eat healthier dinners and have been loving this black bean spaghetti from Costco. It doesn't have much of a taste (which is a good thing!) but has tons of protein and fiber. 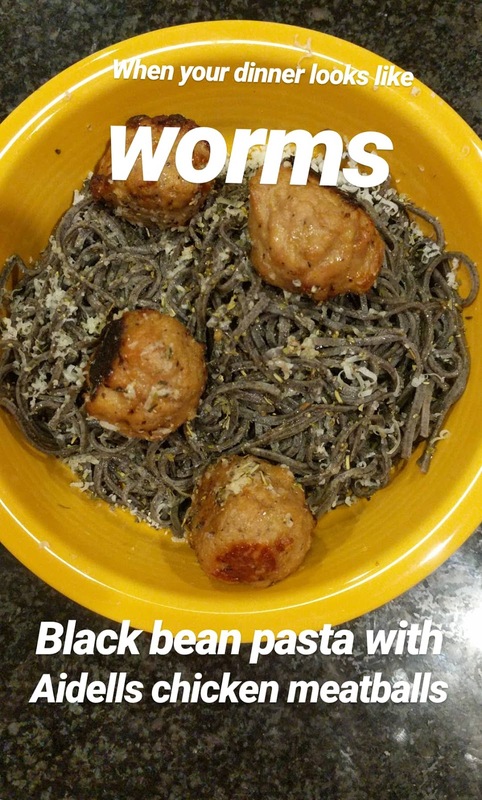 Good swap for actual pasta if you're also trying to go more plant-based. We've had it with Aidell's Chicken Sausage, olive oil and Parmesan and also with ground turkey meat and Rao's Marinara Sauce. I bought Oliver some water beads to play with and he's obsessed. What I like about them is they're non toxic (phew, because the dog puts everything in her mouth!) and biodegradable so if some (or a lot) end up in the yard, it's no biggie. They start out as the size of sprinkle and can get as big as a marble if left in water long enough. 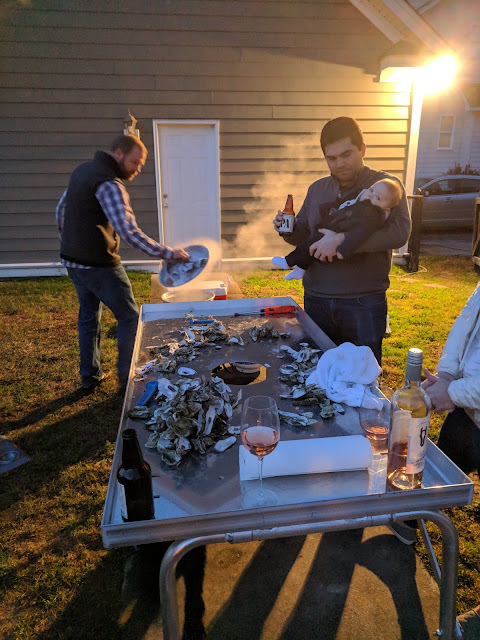 We had an oyster roast at our house this past weekend because I was randomly craving oysters, and Theo was too! 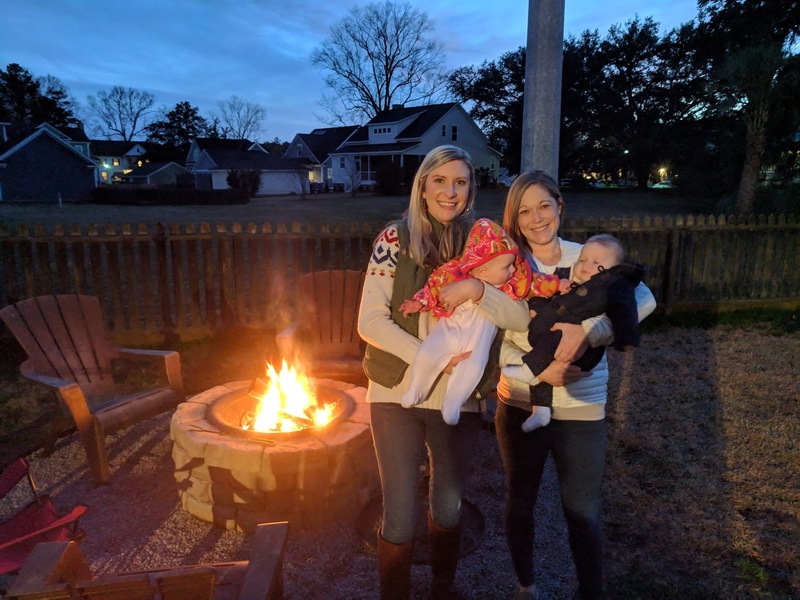 We had our fire pit going too, it was a fun night! 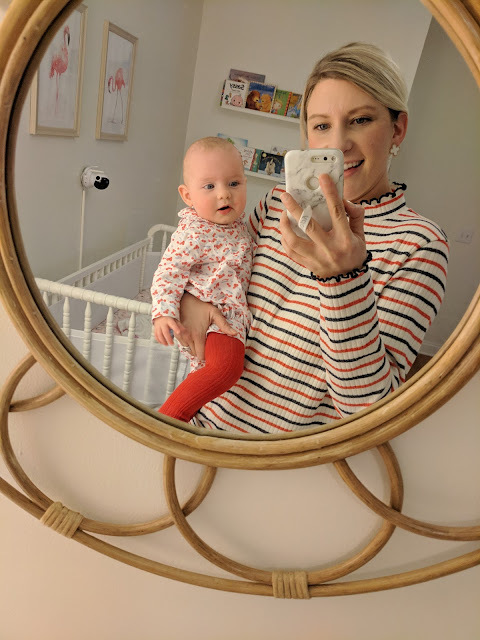 I'm still wearing everything from my Capsule Wardrobe and have bought nothing new. It's actually been really nice not having to waste time sorting though clothes. I have those select items to choose from and that's it. I've been starting to look around what I'm going to use for my Spring Capsule and I definitely think it's going to be a lot harder. There's just so many cute things for spring! 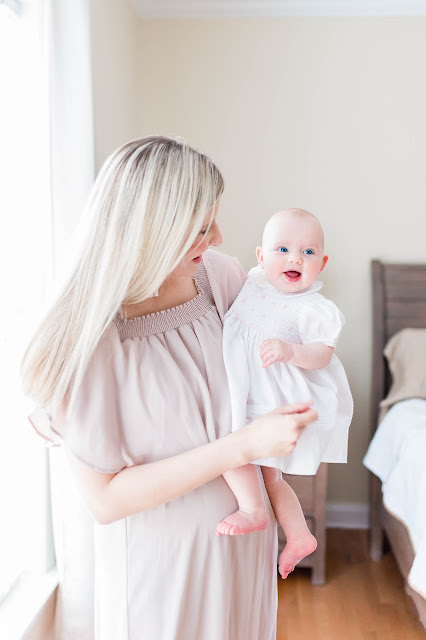 My friend Cait is an amazing photographer and came over to take some Milestone Pictures of Elsie this week. 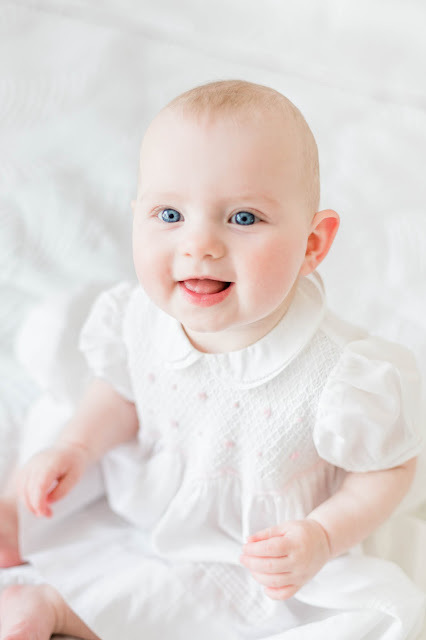 This is the best time for those type of pictures because she can sit up well, but not yet crawling, and is SO happy and smiley. I think 7 months might be my favorite age. But then again, I say that about every age past the newborn stage! I started reading Breasts: The Owners Manual again and I forgot how informative and interesting it is. It's written by Dr. Kristi Funk, she was the breast surgeon who operated on Angelina Jolie and Sheryl Crow. She did tons and tons of research on what causes and doesn't cause breast cancer, really all cancers. If you live by this lifestyle, you'll also decrease your risk of heart disease, diabetes, and other chronic diseases. It's really such an interesting book and I highly recommend it! That pasta does look strange! How did it taste? 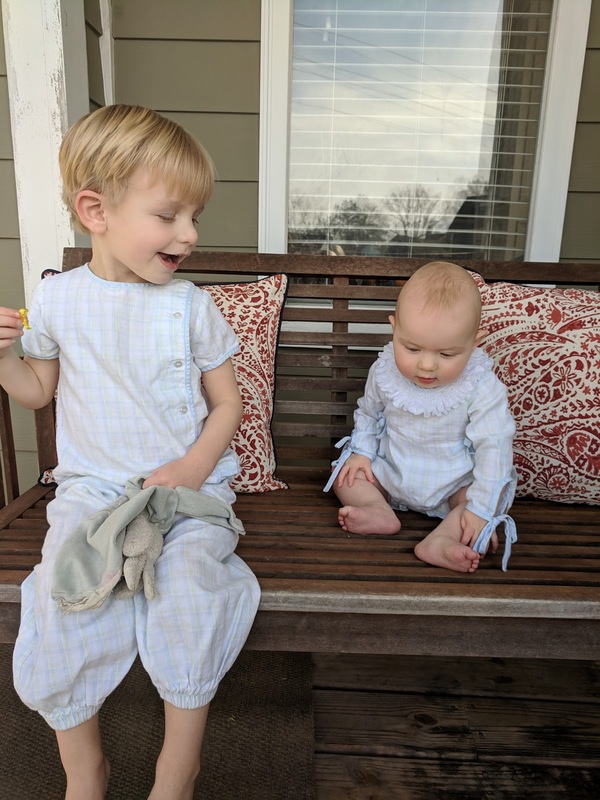 Cute pics of the kids. Your oyster roast looks fun!